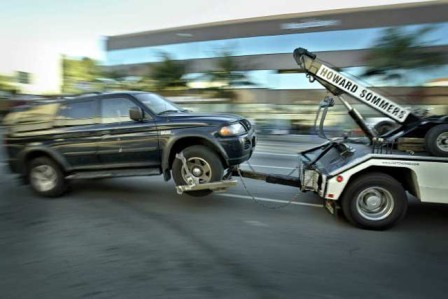 A federal appeals court panel Wednesday unanimously struck down a city policy allowing the Los Angeles Police Department to impound cars for 30 days without a warrant. The three-judge panel of the U.S. 9th Circuit Court of Appeals in Pasadena reversed a finding that the policy is not a seizure but a temporary forfeiture, so constitutional protections do not apply. Lamya Brewster of Fontana sued Los Angeles, its police department and Chief Charlie Beck in 2014, seeking an injunction and damages for licensed drivers she contends were victimized by the city’s impound policy. The appeals panel’s ruling allows the lawsuit to go forward in federal court in Riverside. The appellate panel determined that police cannot place a vehicle on hold without a showing that the action does not violate the Fourth Amendment, which bars unreasonable searches and seizures.